On 4 November, ITER received Yoshimasa Hayashi, the Japanese Minister of MEXT—the Ministry of Education, Culture, Sports, Science and Technology with oversight responsibility for Japan's participation in the ITER Project. 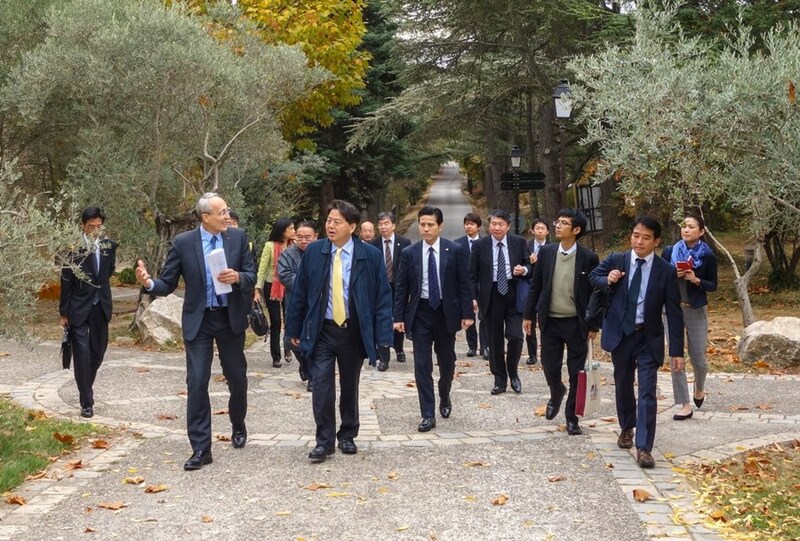 The status of Japan's contributions formed a focal point for interactions between the Minister and the ITER Director-General, seen here walking in the park of the neighbouring Château de Cadarache. Minister Hayashi, who was appointed to his position last August, had met with Director-General Bernard Bigot during his visit to Japan last month. At the Director-General's invitation, he took the first available opportunity to see the ITER site for himself. Historically, Japan has been a member of the ITER Project from the earliest days—as one of the four original partners involved in the conceptual design phase, and host to one of the three Joint Work Sites established in 1992 for subsequent engineering design activities. Japan is contributing a broad array of technical components to the project, including toroidal field magnets and magnet structures; conductors for the central solenoid conductors; power supply components for the ITER neutral beam program; the blanket remote handling system; the divertor outer targets; and the atmosphere detritiation system of the Tritium Plant. The status of these contributions formed a focal point for interactions between the Minister and the ITER Director-General, framed against the physical backdrop of the ITER worksite and visits to specific facilities, including the very centre of construction in the Tokamak Pit. During the lunch meeting that followed, discussions centered on the remaining challenges of cooperation among the seven ITER Members—from complex budgetary issues to the way in which collaboration between Europe, Korea, Japan and the ITER Organization is leading to structured, predictable progress on the fabrication of toroidal field coils and vacuum vessel sectors. The two leaders also brainstormed on specific measures that could stimulate the further participation of qualified engineers from Japan. On his departure, Minister Hayashi reaffirmed what many other high-level visitors have remarked: that whatever one has heard about ITER from afar, nothing quite delivers the scope and ambition of the project like an in-person visit.